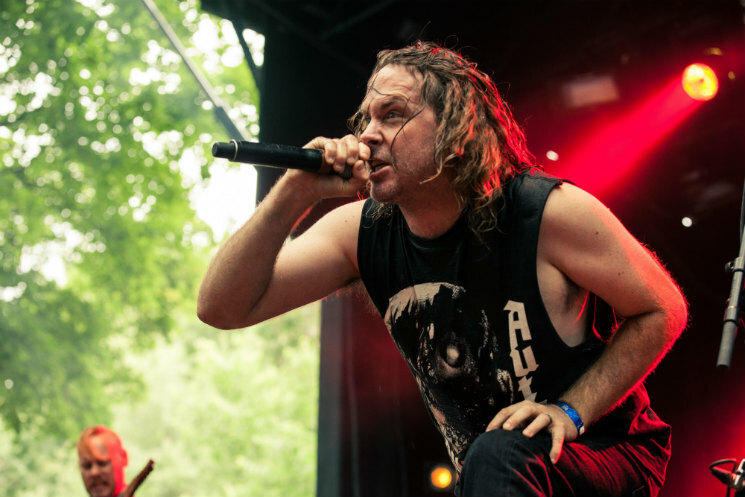 Deep in the forest of Parc Jean-Drapeau, Cattle Decapitation dragged something ugly and writhing into the world. Playing on the day that their latest album, The Anthropocene Extinction, was released, there was an added virility to their set that imbued their eco-critical deathgrind with even more energy. Travis Ryan's vocals are always something to behold — no one does revolting pig squeals quite like he can — but lately he's been experimenting with additional vocal techniques, to great effect. The raw, anguished but somehow melodic scream-singing that began to manifest on 2012's Monolith of Inhumanity have come to the fore on their latest effort, and hearing those wretched, wrung-out cries in person as he shrieked his way through "Forced Gender Reassignment" and "Pacific Grim" was something extraordinary. While they channel the aesthetic of the abattoir, and the sheer brutality of the music feels like it could strip skin, there's an awful lot of joy to be found in their particular brand of grotesque catharsis. Also, while they played "Mammals in Babylon," a woman breastfed her tiny baby (who was wearing ear protection) in the middle of the churning crowd; it was perfect.